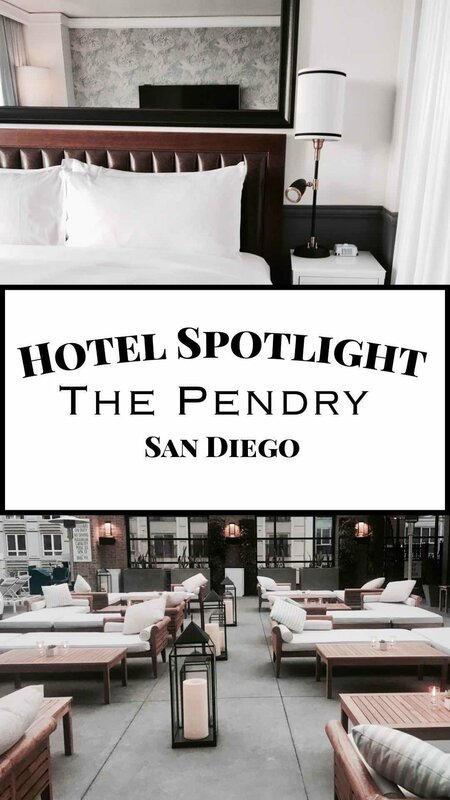 Hotel Spotlight: Pendry San Diego, California — Sapphire & Elm Travel Co.
At Sapphire & Elm Travel, we love a gorgeous hotel. A hotel can make or break a travel experience. We were beyond excited when we heard a new luxury hotel was opening in our own backyard, Pendry San Diego. Part of the Montage Hotels & Resorts family, we anxiously watched as the Pendry was being built just a few blocks from our house. Pendry San Diego is located on J street between 5th and 6th avenue in the heart of the Gaslamp Quarter, with easy access to just about anything you could want in downtown including a few of our favorite tiki bars. The Pendry has so much to offer, you might never want to leave. As one of the most anticipated hotel openings of 2017, we knew we had to book a staycation. The Pendry San Diego far surpassed expectations. As soon as you enter the Pendry, you are met with gorgeous interiors. The fireplace and sitting area oozes luxury and sophistication. It makes you feel like you are in a friends living room rather than a hotel a hotel lobby. Off to the left is the hotel bar, Fifth & Rose. This isn't your average lobby bar. It's gorgeous, no detail left untouched from the tile on the floor to the detailing over the bar. It's chic and sophisticated, welcoming hotel guests and locals alike. Fifth & Rose serves up snacks and specialty cocktails. Our favorite is the refreshing Dude, Where’s My Yacht made with Belvedere, Moet, Lime Juice, Honey, Cucumber. There's a lot to love about the Pendry San Diego before you even leave the ground floor! The rooms at the Pendry are an oasis above the hustle and bustle of the Gaslamp. Our room had a killer view of both downtown and the harbor. The comfy chaise lounge in front of the window was the perfect spot to relax and take in the scenery. The bathroom has fun wallpaper, marble counters and an oversized rain shower which separates the bed from the en suite bath. The rooms are almost too pretty to touch. You can find the pool at the Pendry on the third floor. The space is aptly named, The Pool House. The third floor deck is equipped with the pool, cabanas, lounge area and a bar. It's perfect for hotel guests to relax and a welcome addition to the neighborhood. In our opinion, for a city with nearly perfect weather year round, downtown San Diego is seriously lacking rooftop bars. The Pool House opens to the public and hosts Rooftop Social nightly starting a 5pm and they have a killer happy hour Monday to Friday with half priced cocktails and appetizers. To end the week, Pool House hosts Pool House Sundays; a day club featuring rotating DJs, food and drinks. When you work up an appetite, Pendry has plenty of options besides Fifth & Rose and Pool House. You can eat at Provisional or Lionfish. Provisional is a restaurant-marketplace hybrid and offers sit down and take away dinning. The space has a gorgeous espresso bar open from 6am to 2pm. Provisional serves breakfast, lunch and dinner in an elegant yet inviting space. For a more upscale dinning experience, the Pendry brings you Lionfish. Like the hotel itself, Lionfish was also a highly anticipated restaurant opening in the burgeoning foodie scene in San Diego. The restaurant is a destination in itself and serves up modern coastal cuisine. The Gaslamp Quarter in San Diego is a premier nightlife destination, and the Pendry has you covered no matter what mood you are in. For a night out on the town, look no further that Oxford Social Club. Oxford Social Club is a premier nightclub with the motto be sophisticated or don't. Oxford Social Club has a loungy vibe, with a lively dance floor. Bottle service and vip experiences are available and they host top Djs. For a more relaxed evening or for watching sports, you can head to Nason's Beer Hall. Nason's Beer Hall has an impressive menu of craft beers and has vintage bar games for patrons. If you're not into beer, they've also got you covered with a full bar. And to top it off, the Rosé is on point for a beer hall. We tested it ourselves! After all the indulgences Pendry San Diego has to offer, the best place to relax is their ultra luxurious spa. Spa Pendry offers services from messages to facials to body wraps. And if all of this isn't enough to convince you that you need to stay at the Pendry asap, in fall of 2017 the Pendry introduced the first Champagne Vending Machine in Southern California. That's right, a vending machine dispensing nothing but Moët & Chandon Champagne. Ready to experience Pendry San Diego for yourself? Contact us today.